Très belles bouteille.Je vais l'offrir pour noël... il va être très content merci. Trou du Diable is one of Canada’s finest Craft Brewers and this latest IPA offering is a measure of their quality. 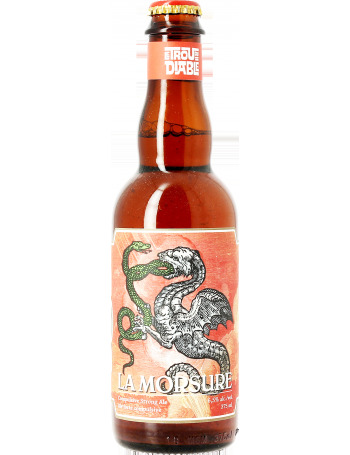 La Morsure – literally “the bite”- is a crisp, hoppy creation, which pours translucent copper-tinted blonde with a generous yet compact white head. The aroma positively screams hops, both fruity and resinous, evoking tropical fruits and pine by turns, with underlying caramel tones. The taste is also a riot of hop flavours, with tropical fruits, citrus, resin and caramel., all topped off with an agreeably crisp, bitter finish! Fangs very much Trou du Diable!